Mr. ChenYu, Born 5/23/1962, in Chen Jia Gou Wen County, Henan province, currently resides in Beijing China. He is 17th generation Chen Taijiquan master Chen FaKe’s grandson and 18th generation Chen Taijiquan master Chen ZhaoKui’s only son. At 7 years of age he began to follow his fathers teaching seriously training taijiquan. In May 1989 he was invited to Henan, ZhuMaDian to teach Taijiquan. After this he decided to quit his job and focus entirely on spreading Chen Taijiquan which he teaches to this day. He is currently; the Honorable chairman of the Beijing city Chen style Taijiquan, Hunan Province, ChangDe city Chen ZhaoKui Martial arts research Association, Guest professor at Shantou Research Center, Special skills advisor to Hong Kong China Chen Style Taijiquan Consulting company, Deputy Director of TaijiNet Gongfu Friendship Association, President of Beijing Chen ZhaoKui Martial Arts Research Association. From the age of 7 years Chenyu Learned his fathers gongfu. His father strictly demanded that he practice seriously, requiring him to practice 10 times per day. With diligence he practiced the proper gongfu training methods and practical useage together. Particularly after his father’s passing he reallized the heavy burden that he must bear, leading him to further “close the door and bitterly practice” for three years. During this time he practiced extremely seriously and made great achievement. Nowadays his gongfu is even higher, and technically quite precise, he carries on his father’s tradition making his own brilliant contribution and spreading Chen Style taijiquan. In 1976 when he was 14 years old he went with his father to Henan Province Wen County national Taijiquan meeting performing Yi Lu and Er Lu; Pao Chui. This was his first public appearance and his clear and precisely performed fist created quite a stir. In the 80’s he attended the Beijing Chen Style Taijiquan Association founding plenary meeting performing Er Lu; Pao chui and Broadsword. This was his second public appearance, once again creating a buzz. In August of 2002 ChenYu was an invited expert at the International Taijiquan annual conference. His performance gained cheers from the audience and interviews from many reporters who named him, “JiangMen HuZi” Mr. ChenYu began Teaching at 17 years of age and has been teaching for almost 30 years. Since he committed himself to spreading Taijiquan in ZhuMaDian he has taught in Dan Dong, Shantou, Changsha, Changde, Guangxi, Henan WenXian, Switzerland and more. People who heard of his great skill have also come to study with him from UK, Switzerland, Singapore, Korea, Taiwan, Russia, Japan, USA, Italy, Canada, Hong Kong, Etc. Taijiquan enthusiasts from all over China who also have learned under his guidance number in the thousands. Under his teaching many students in national and international competitions have had great success as well. 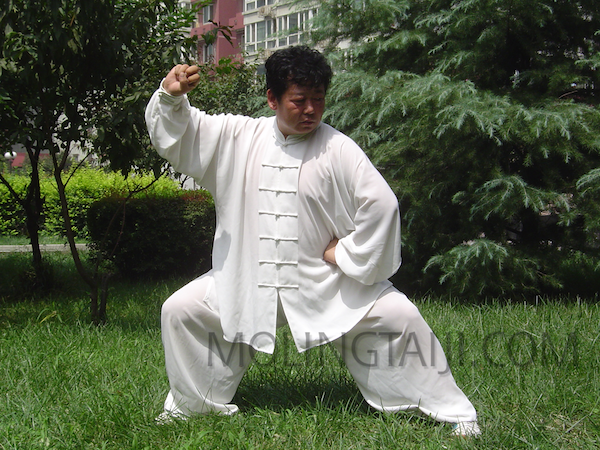 His form while having a low stance, is also relaxed, soft, flexible, natural and expansive; leading to Fa Jin that is more Flexible and lively, with highly developed snap and shake energy. He has won the respect of a vast base of taijiquan enthusiasts. Mr. Chenyu While carrying on his family’s form also created the 43 taijiquan form. His Media spots include: Shanghai Television, JiaoZuo Daily news report, ChongQing Television, Hunan Television, CCTV, Korea Television, China Wing Magazine, American English international martial arts magazine, Japan Martial arts magazine, Hong Kong New Martial Artist magazine etc. For the purpose of helping more people grasp the essence of Chen Style Taijiquan and making communication with students and enthusiasts more convenient, with the help of disciples, ChenYu on the 25th of August, 2001 became a guest in TaijiNet Chat. 9/3/2001 ChenYu Talks Quan on TaijiNet began (www.tai-ji.net.cn). On 5/7/2002 The Chen Style Taijiquan Chen ZhaoKui Martial Arts Research society was created. August 1st 2002 he agreed to become one of TaijiNet’s experts. January 1st, 2003 began to participate as a representative in Beijing Wushu Wan Wei Net. June, 2003, the Beijing Chen ZhaoKui Taijiquan Association, North American website (www.taijigongfu.com) was started.